Much warmer temperatures, and the potential for showers and thunderstorms are on the way for your Monday. Slightly cooler, but staying active mid week. Get ready for much warmer temperatures to return for the start of your work week. You'll want to dress for the warmer conditions, and might want to plan your day around avoiding the afternoon heat. On top of the warmer temperatures, we also have the lingering potential for afternoon showers and thunderstorms this afternoon and evening. Mostly sunny skies are on the way for the start of your Monday. Temperatures have dipped into the mid 50's in the valley overnight, and into the 30's to 40's in the mountains. Clouds will slowly return to the mountains through the day, and valley areas will have a few more clouds on the way for your afternoon. The potential for showers and thunderstorms will return to the Sierra this afternoon, and could impact areas of the foothills, and possibly even extend into portions of the mid valley heading into tonight. High temperatures are projected to end up in the mid 80's to low 90's in the valley this afternoon, and mountain areas will top out in the low 70's to low 80's. 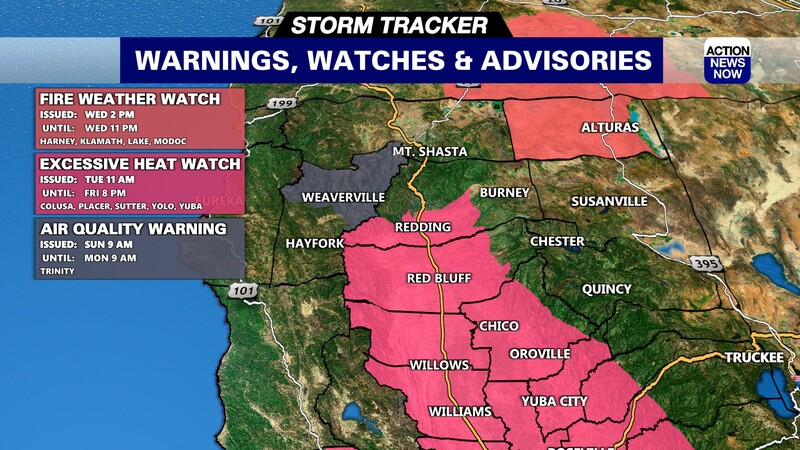 The active weather is expected to fizzle out by around midnight. Cooler temperatures, and more mountain showers and thunderstorms will be ahead for your Tuesday and Wednesday. Temperatures will end up in the mid to high 80's on Tuesday, and then in the low to mid 80's on Wednesday. The potential for active weather will become more widespread on Tuesday, and we will have a decent chance for some activity to spill into the Redding area on Tuesday evening. Showers and thunderstorms will start to develop in the mountains by around noon, and will stay in higher elevations through early evening. The chance for activity in the valley will start to pick up on Tuesday night, with the latest projections showing very active weather possible in Redding. 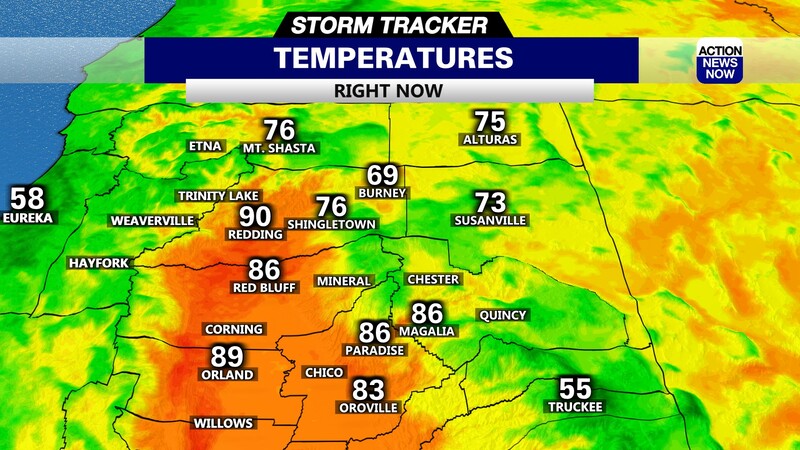 Other areas of the valley may also have some showers or thunderstorms, but are not expected to be impacted to the same extent as Redding. More mountain showers and thunderstorms will be likely in the mountains on Wednesday, but the potential does not look as promising in the valley. Temperatures will rebound back into the mid to high 80's on Thursday in the valley. Active weather will still be possible in the mountains, but doesn't look as strong as what's expected early to mid week. Temperatures will then dip back into the low to mid 80's on Friday, and will stay in that range through the weekend. Another wet system is projected to impact the West Coast late this week, and this weekend. 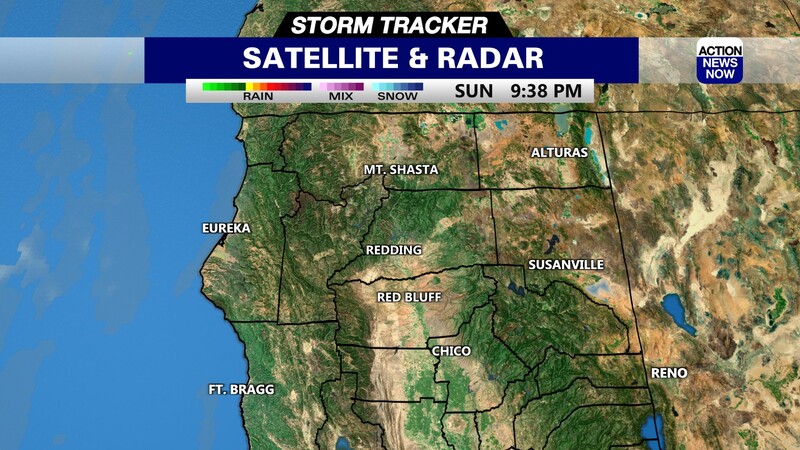 That could bring more showers and thunderstorms to the valley, but confidence is not very high at the moment. We should get a much better idea of what to expect in your long range forecast over the next few days.